Deck building can be incredibly satisfying, both the process of building it and the finished product. 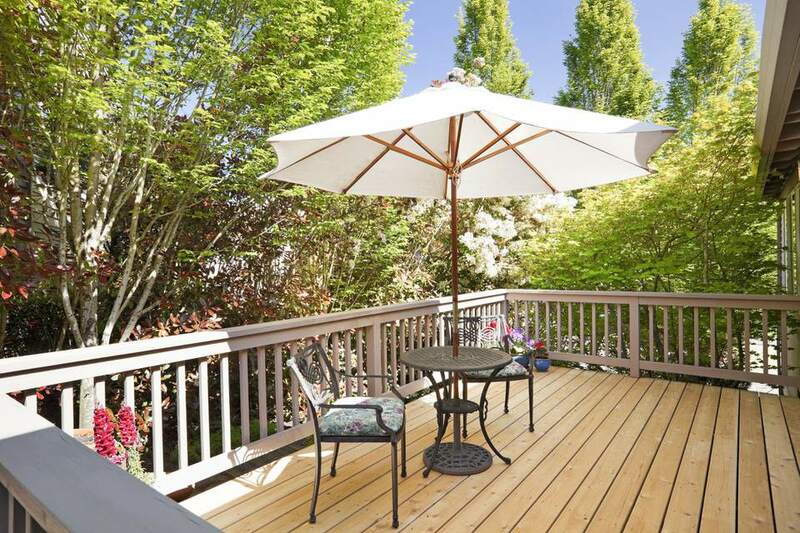 A beautiful, well-constructed deck can expand your living area in warm seasons, bring family and friends together, and provide much needed hang-out space when you need to unwind. But too many homeowners make deck building mistakes that can ruin their enjoyment or compromise their safety. Building code is often derived from the International Residential Code (IRC), with amendments made at the local level. While you need to be aware of IRC requirements, it's often the local changes that do-it-yourself builders forget about. Local amendments reflect the area's climate and other needs. Only your permitting department can provide you with information about the deck-building code that is unique to your area. Footers should be in undisturbed soil. If the soil has been disturbed, the footers must run deeper, sometimes as deep as 48 inches. Footers must extend below your area's frost line to avoid frost heave. At the very minimum, footers must extend 12 inches below grade. Elevate the tops of the footers at least an inch above grade to keep them high and dry. A classic error that can result in deck collapse is when do-it-yourselfers attach the horizontal beam (sometimes called a girder) to the vertical support posts on the side of the support posts. Formerly allowed by building code, this is now considered a substandard practice, as bolts can have poor shear strength. The far better method that aligns with most building codes is to rest the beam on top of the support posts. The beam can rest on metal column caps attached to the tops of the support posts. Or the support posts can be notched out with a reciprocating saw to allow the beam to rest in a pocket. Then, attach the beam to the posts with galvanized carriage bolts, washers, and nuts. Inside the home, your floor covering rests on a subfloor, which in turn rests on long pieces of milled or laminate lumber called joists. Your outside deck works much the same way but without the subfloor: deck floorboards are fastened directly onto joists. Without that intervening subfloor, the deck boards bear all of the load. Composite and PVC deck boards, especially, are not as structurally sound as most woods, especially hardwoods, so they may require tighter joist spacing. Consult joist span tables specific to the type of deck flooring you intend to install. Deck floorboards range from inexpensive pressure-treated boards up to exotic hardwoods and composite woods. Assess your personal situation and purchase deck boards accordingly. For example, if you are on a strict budget or are building the deck for quick resale, consider using pressure-treated or hem-fir (hemlock-fir combination) boards. High-end homes may demand high-end exotic hardwoods like ipe. If duration and low maintenance are most important, composite woods and PVC-based materials return the best value. The ledger board acts as the spine of the deck, anchoring it to the most stable surface around: the house. Do-it-yourselfers are sometimes prone to attaching the ledger board on top of the siding. This method is wrong because intervening layers of siding and possibly exterior rigid foam insulation mean that the lag screws cannot penetrate far enough into the rim joist. To attach the ledger board properly, you first need to cut out all siding, house wrap or tar paper, and foam insulation, so that the ledger board rests directly on the rim joist. When you build a deck onto the side of the house, it can end up covering or blocking all sorts of services: water faucets, dryer vents, air conditioning units, and exterior outlets. Relocate any services that may be affected by the new deck. In some cases, your deck permit may not be approved by your local permitting department if it hinders egress from a basement window. Using the wrong type of fasteners can have a catastrophic effect on your deck. Because decks are located outdoors, they receive a tremendous amount of abuse from the elements. Plus, the wrong fastener can react with the preservative in wood and hasten corrosion. Purchase fasteners that are approved for deck-building. Usually, these are stainless steel, polymer-coated, or hot-dipped galvanized materials. One benefit of building a low-rise deck under 30 inches tall is that, under many local building codes, handrails are not required. Excluding railing saves time and money, plus it preserves your view. But is this really a good idea? Thirty inches is still high enough to fall and injure yourself. Many deck builders implement hand railing even when the code does not require it for just that reason. Many homeowners begin their deck-building project optimistically enough, believing that they can build it alone. Months later, the project has ground to a halt. Before taking on this project by yourself, familiarize yourself with all of the intricacies involved in deck-building and assess whether you are right for the job. If not, seek the assistance of a local licensed general contractor or deck builder. Why Should You Consider Plastic Deck Lumber for a New Deck? Which Is Best for a Deck: Wood, Wood-Composite, or PVC?